Baghdad: An agreement has been reached by Iraq and Iran to raise the issue of an Iranian opposition group based in Iraq in the next round of talks between the United States and Iran. Iraqi parliamentary sources told Gulf News according to an Iraqi-Iranian agreement the presence of Mujahideen Khalq Organisation (MKO) in Iraq will be discussed in US-Iran talks. Some leaders in the ruling coalition accused US troops of thwarting Iraqi Prime Minister Nouri Al Maliki's resolution to relocate MKO from Camp Ashraf in Diyala to a country other than Iraq and Iran. 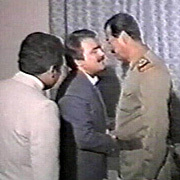 The Iraqi Minister of State, Hassan Al Sarri, accused MKO of funding, training and equipping Al Qaida insurgents and Saddam Hussain's supporters. He told Gulf News: "The Americans are fully responsible for the MKO file. MKO is a serious threat to Iraq's security and stability." Some officials at the centre accused the Americans of arming MKO and some Sunni tribes in Diyala as a pretext to address the Iranian penetration. Anwar Al Alusi, a political analyst, told Gulf News: "The MKO file is an American redline for Al Maliki and Iranians alike because it is part of the US strategy in Iraq. American forces, in 2003, besieged Camp Ashraf where MKO fighters stayed and took them into a direct protection." Rumours are rife that the US intelligence is using MKO to track Iranian intelligence network in Iraq and to spy on Shiite clerics in Najaf and Karbala. On the other hand, "Iranian intervention in Diyala province has reached dangerous levels after more elements of Al Quds Army, affiliated to Iran, entered Diyala", Abdul Karim Hadi Mutalk, a tribal leader in Baquba, told Gulf News. "We have informed the Iraqi government [but] fear that some sections know about Iranian penetration."